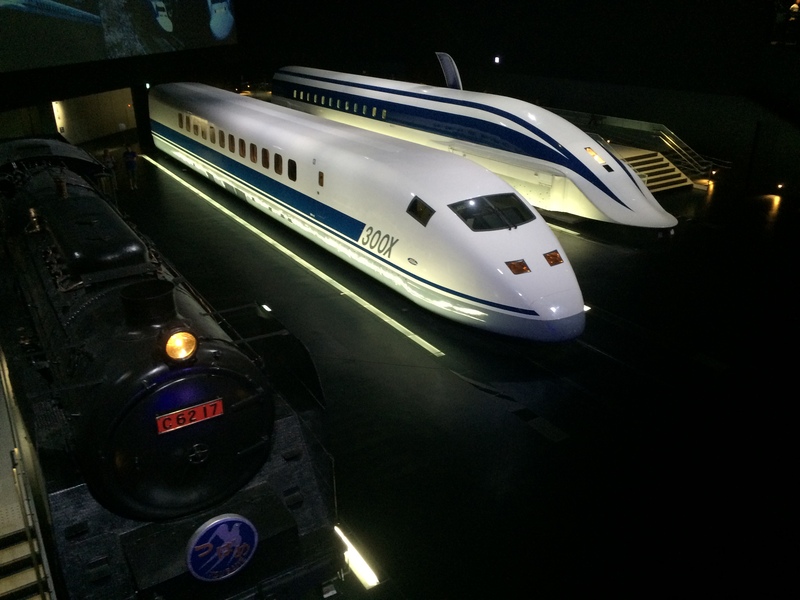 We fly from Tokyo past Mount Fuji on the bullet train and arrive two hours later in Nagoya, the manufacturing centre of Japan, where its cars, trains and planes are made. It also has fantastic museums and a castle set in a beautiful garden. That night I ate local at a yakitori restaurant. Here you sit at a bar and meat on skewers is fried behind the bar. Basically kebabs and beer but very, very fine kebabs. My favourite was cherry tomatoes wrapped in bacon, grilled to perfection. I remember a 1970s British dish, large tinned plum tomatoes covered in thick bacon and cheese and put in the oven. This different approach to taste and design between the island nations makes it clear why much of the British car industry was taken over by Japan. I learn more about Japanese attention to detail on a tour of the Toyota factory. Here I witness “Just in Time Management” and “Total Quality Control”. We see cars welded by robots, a mesmerising experience. Assembly line workers install components, wiring and engines in an unhurried yet efficient manner. I cross town to the train museum. Here are steam trains, all the generations of bullet trains and a Maglev train with a shark’s fin, which seems a bit boastful. They also have a huge train set surrounded by lots of enthusiastic men blocking out the view of little boys. I return to Nagoya station to take the short journey to Kyoto. Kyoto is the spiritual and historic centre of Japan, with gardens, castles, shrines and geishas, and therefore tourists. I take a break from the city and visit a bamboo forest, a magical place where giants tower all around. I walk past a moss garden, where gardeners sweep the moss clean. I end by the river at a traditional teahouse, sipping tea as boats drift by. Back in the hurly burly of the city accompanied by Kunio, our local guide and agent, I wander through Nishiki Market, an arcade lined with food stalls. This is not your average food market – delicious sushi is followed by delicious pickles and hot chestnuts. There are also knife shops (including a former samurai sword maker). Onto Termachi Market, a street that has been trading for hundreds of years, with shops selling prints, books, handmade paper, lacquer, stationery and crafts alongside clothes shops. At the end of the street is a famous butcher selling very expensive wagyu beef. I continue to Gion, the geisha’s neighbourhood. I was told by locals that not many women want to be a geisha these days and I can understand why. For the first five years (from 15 to 20) the geishas, known as maikos, undertake an apprenticeship learning to sing, dance, dress, play instruments and entertain. They then become a geiko and become entertainers of the (predominantly) businessmen who hire them. Once married they cease to be a geiko. In Kyoto, parents are not keen on their daughters being a geisha, with more now coming from Japan’s outer provinces like Hokkaido. Gion is an attractive area and we wander through the small streets lined by wood fronted buildings with paper lanterns and lattice screens. Suddenly a pack of tourists emerge, and then another, and another. It’s the early evening, the time geishas are said to emerge, and the packs are geisha hunting. It could have been a ghost tour or a group of enthusiastic bird spotters but it certainly changed the atmosphere. We hit the old town with its narrow alleys full of busy bars and intimate restaurants. It is Saturday night and Kyoto is buzzing. We sit in a local café by the river and eat spicy beef and drink local beer. The next morning I take the train to Hiroshima. After Tokyo and Kyoto, Hiroshima has a relaxed, laid back feel with shady tree lined streets and little traffic. I board the tram to the Peace Park and museum. I was arriving not long after the commemoration of the 70th anniversary of the dropping of the bomb, so the events of the 6th August 1945 are fresh in my mind. I get off the train and look up and there is the Atomic Bomb Dome – ground zero. This is directly below where the bomb exploded, razing everything to the ground in 5kms in every direction and killing over 100,000 people. Now, it stands peacefully by the river. I continue to the Peace Park and island in the river containing shrines and the museum. 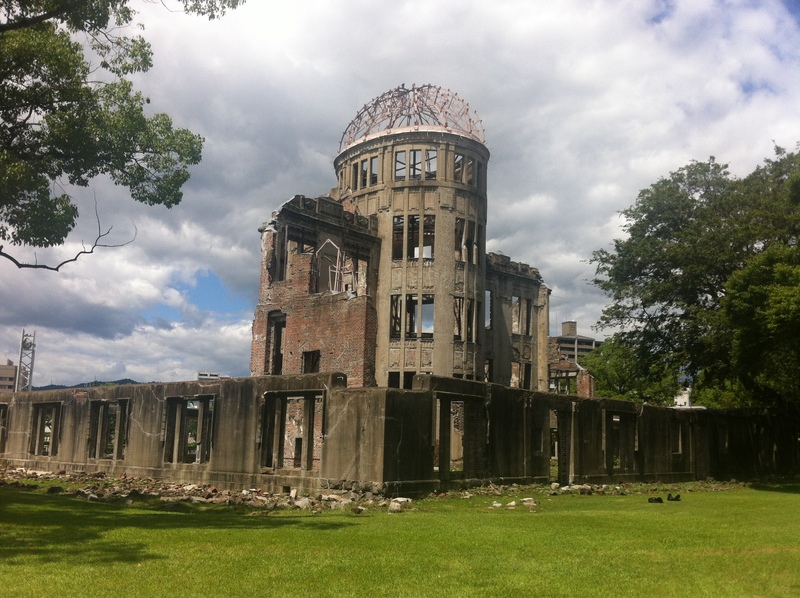 The museum takes you through the history of Hiroshima in the run up to the bomb, the aftermath and how the city was rebuilt and regenerated. I walk past a flame that will burn until all the world’s nuclear weapons have gone. A group of Buddhist monks are chanting. 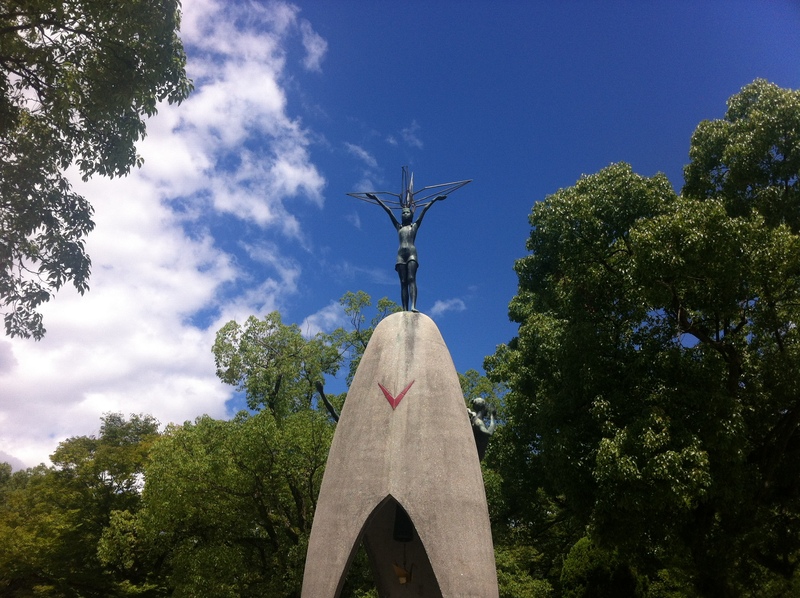 The most moving shrine is the Children’s Peace Monument, inspired by Sadako Sasaki. As an 11 year old dying of leukaemia she decided that if she could make 1000 paper cranes she would live. She died before she had completed the task and her classmates continued the rest. 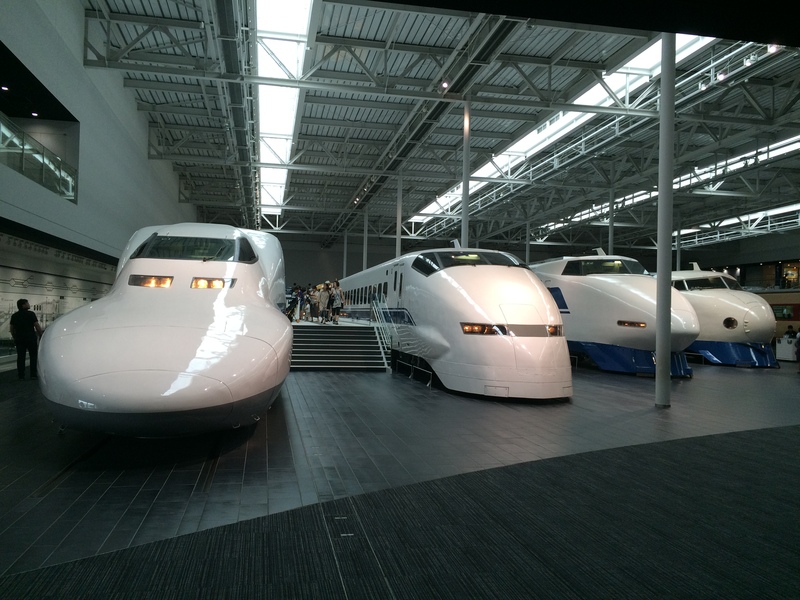 I take the Thunderbird train across the central island of Honshu to Kanazawa on the west. It’s a scenic journey as I fly along, the sea on one side and rice terraces and hills on the other. 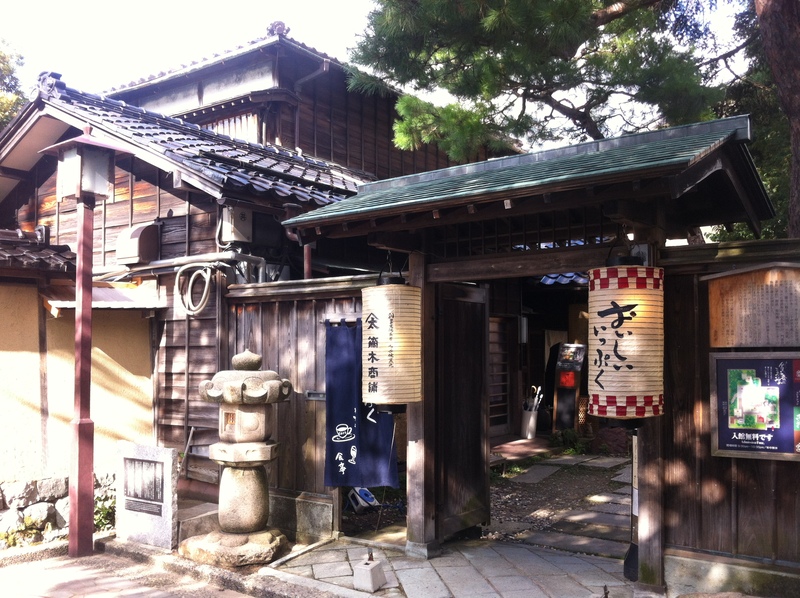 Kanazawa was a samurai town and a centre of gold, crafts and fishing. The samurai have gone but their buildings remain – with no industry, the city was spared the bombing of the war. 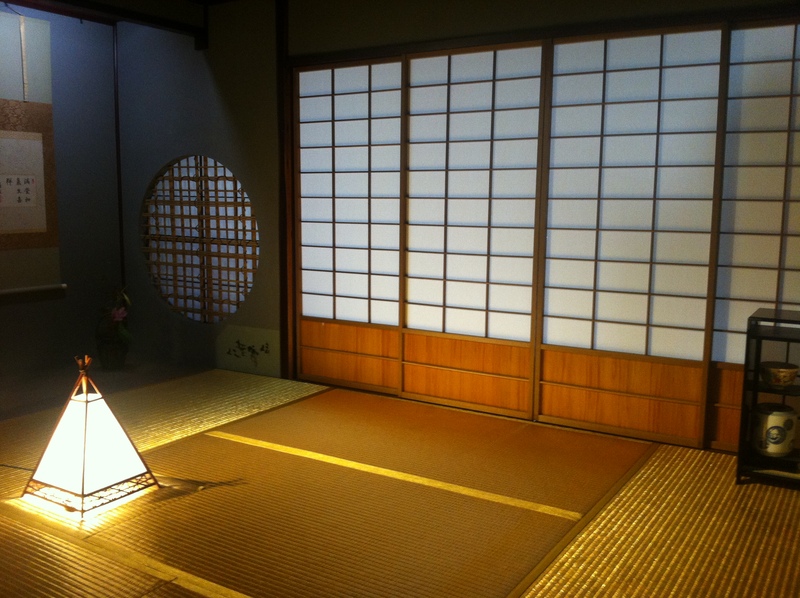 Kanazawa is famous for its porcelain and pottery, silk, lacquerware and gold leaf. The gold accounted for the region’s wealth and the alluvial gold was rolled, flattened and used to gild. A group of school kids sing a cheery welcome when I arrive at the designer station. I take a bus to the samurai district, crossing a river to see a row of the distinctive wooden houses. I walk along the street and the samurai district spreads around me. Small lanes lined with wooden houses, many containing craft workshops or museums. 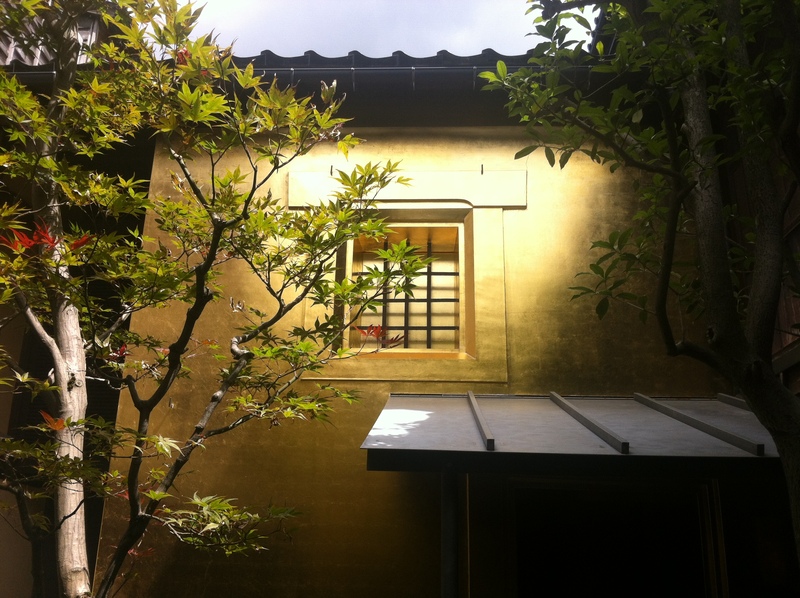 I visit the House of the Samurai with a lovely garden and a scary suit of armour, a pottery based around a pristine courtyard and a silk dyeing house, before losing myself in the alleys. I continue onto one of Japan’s greatest gardens – Kenroku-en. Very formal Japanese gardens leave me cold – I am not a fan of raked gravel and artfully placed stone. 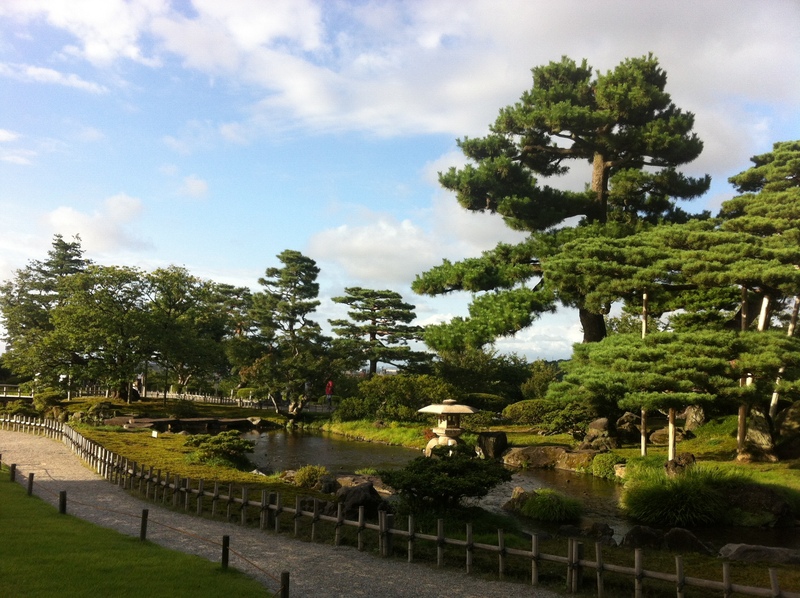 But Kenroku-en is much more than this – Capability Brown meets Japanese formality. Gentle slopes covered in woodland glide into lakes shimmering underneath sensuous bridge. 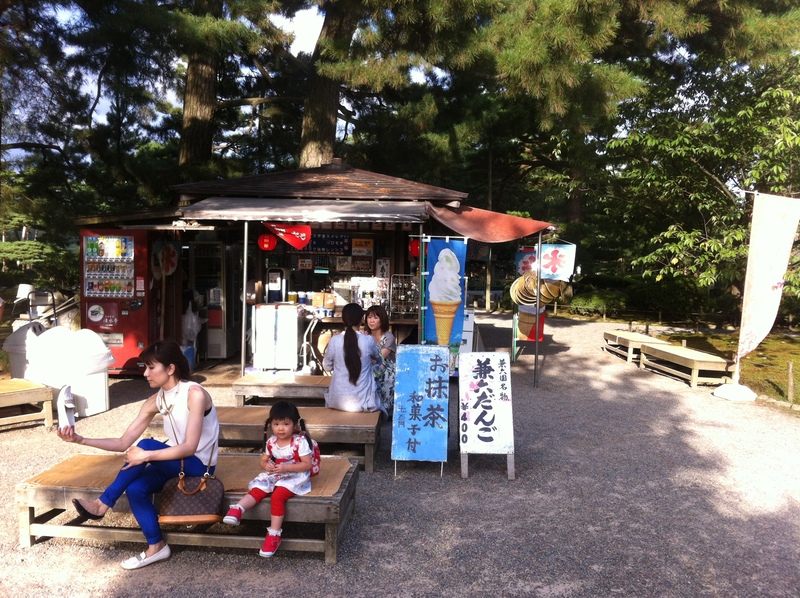 Shrines peak out of forested glades, cranes wander by and a tea house blends in seamlessly. I have a cup of tea and take it all in. Being in a seafood centre, that night I visit an izakaya (known for sake and food) and dine on oshi-zushi, a thin layer of fish on top of rice. This is said to be the forerunner of sushi and is delicious. Early in the morning I cross the Kanazawa Castle Park, the giant gatehouse and walls dominating the park. The “Castle of 1000 tatami” housed the Maeda Clan for 14 generations. Onto the narrow streets streets of Higashi-chaya-gai, the wooden slatted houses of the old geisha district. 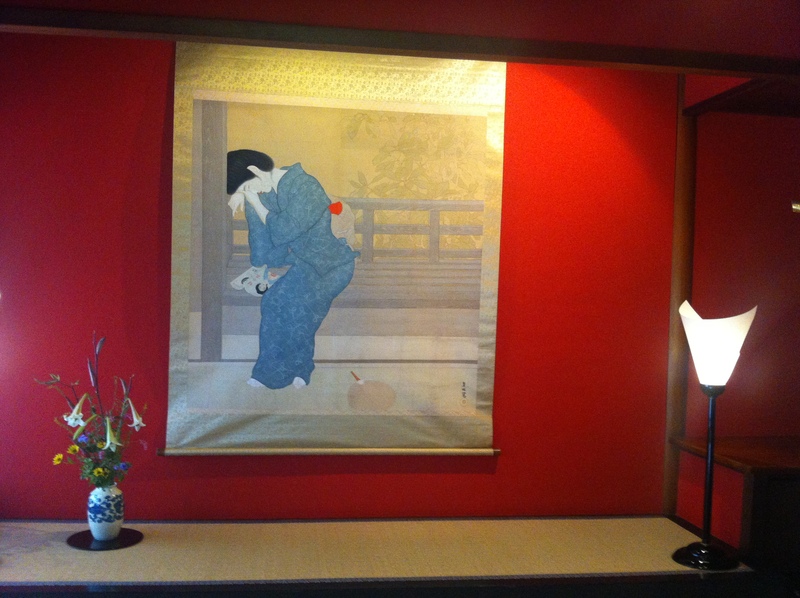 I step into Kaikaro, an upmarket geisha house from the 19th century. A red lacquer staircase leads to rooms simply but beautifully furnished with white, blue and red and one with gold dusted tatami matting. Onto what was a sake house, where the geishas would entertain and play drinking games over a glass or four. I visit a house with a gold leaf wall and a gold room – it sells, unsurprisingly, gold. At the Kanazawa Gold Leaf Museum I learn how gold is pressed and used (gold leaf, lacquerware, ceramics, inlay, cloisonné , glass, calligraphy, cosmetics and sweets) and look at lots of gold. For my last night I enjoy a shabu-shabu where I cook thin slices of wagyu beef in a broth and then dip them into various sauces. I wash it all down with warm sake from a ceramic pot, and leave Japan with a warm glow.